There have been many times, all throughout history, where a person’s name meant life or death or the making of a career. In the world of crime, being the offspring of a notorious criminal could garner you respect or a bullet to the head; depending on how many enemies your parent(s) had. And, even with monarchal governments, having the right name could mean ascension to the throne. Your name isn’t just what people call you. From the day you are born, your name and its meaning become who you are. The name, Creed, and the legacy that goes along with it – cinematically and figuratively – are the main subject matter of the latest Rocky film (or reboot). In Creed, the son of professional boxer Apollo Creed (Carl Weathers), Adonis “Donny” Johnson (Michael B. Jordan) seeks out famed boxer Rocky Balboa (Sylvester Stallone) to train him to be as great a boxer as his dad. For those who are not familiar with the Rocky films, Apollo died in a boxing match with Soviet athlete Drago (Dolph Lundgren); unknowingly leaving behind his pregnant mistress and a son he didn’t know he had. Written and directed by Ryan Coogler (with scriptwriting help from Aaron Covington), Creed tackles issues of fatherhood and the lack thereof from both sides of the spectrum. Where Rocky misses having his son in his life, Donny misses having a father-figure, period. After Donny’s mother died, he’d been placed in group homes for a few years until Apollo’s widow, Mary Anne (Phylicia Rashad) takes him in and raises him as if he were her own son. This film also takes the meaning of “creed” (a set of beliefs or aims that guide someone’s actions) and really draws its audience into the story. Donny’s creed is that he wants to develop his own career and not be known as the “fake Creed.” Deep down, he’s just a kid trying to live up to his father’s legacy and make him proud. 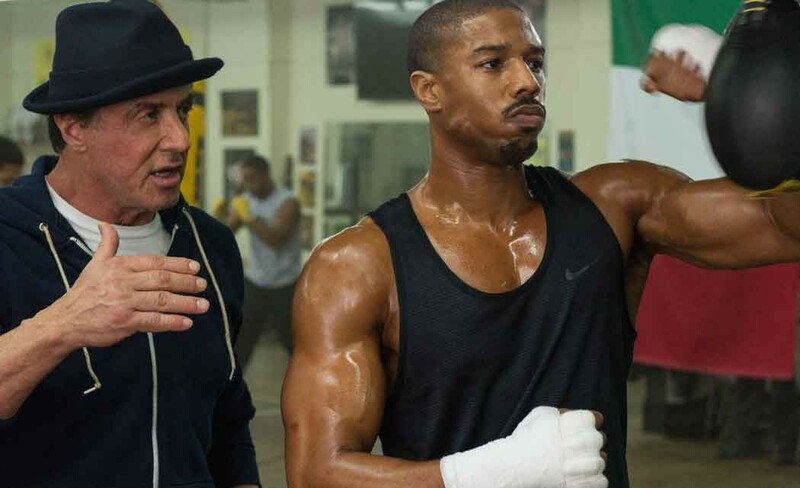 Creed, as the latest film in the Rocky Balboa saga, does what 2006’s Rocky Balboa the movie couldn’t: reinvigorate the franchise with a younger, fresher talent in Jordan. Coogler, who also directed the critically acclaimed Fruitvale Station, has worked with Jordan before and obviously went with the actor he knows and trusts to really bring the story to fruition. Not only does Jordan bear a striking resemblance to Weathers, but he’s also got the talents to pull off the character. His breakout role was as baby-faced Wallace in season one of HBO’s The Wire, where he really made you root for Wallace to not become a statistic. Ten years later, a more mature Jordan gave a rousing performance as Oscar Grant in Fruitvale Station, where the audience couldn’t help but take Jordan seriously as a bonafide actor. These days, Jordan has been in some high profile films where he shows just how good he is. Coogler made a wise choice. Creed also stars Tessa Thompson as Bianca (Donny’s love interest) and Jordan’s former Wire co-star Wood Harris as Tony “Little Duke” Burton (a boxing trainer). While Donny is trying live up to his father’s name, he’s also attempting to create more opportunities for his advancement as a professional boxer. What he has to remember is, family lineage notwithstanding, his creed is something talented and special that doesn’t need to stand on the shoulders of those who came before him. Creed is just plain good all on its own.